We had an intervention in our house two weeks ago. It wasn’t drugs, a boy dog, a forced departure to a wilderness boarding school for troubled teen dogs – no, it was simply that MW decided she wanted our back yard, well, back. As it has been well chronicled, Luna’s rendered the lawn behind the house unplayable for croquet and every other summer pastime we previously enjoyed. The grass was crying out but unable to fight back. MW decided to tilt the odds in our favor. Cue a trip to the local Orchard Supply Hardware store. We bought what they call in Canada snow fencing, and what they call in America contractor fencing. It’s the same thing, a four foot wide orange plastic fence with enough holes to let wind through and enough plastic to keep a physical object like a dog from penetrating. We also picked up some 5ft long wooden stakes. When we dropped the load on the patio and got out the sledge hammer to knock the stakes in, Luna really didn’t know what make of it. 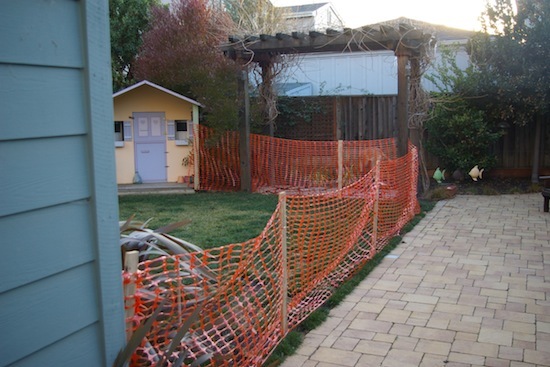 By the time, we’d installed the stakes and attached the fencing material, Luna really didn’t know what to think. She might as well have been staring at the East Berlin side of the Berlin Wall. The fence worked…..for two weeks. Luna proved a lot more creative and cleverer than we’d ever expected. A surprise followed.